So – I like sweet things – like alot, a lot. I don’t remember EVER having as much of a sweet tooth as I do currently and ever since going Paleo just under a year ago. I used to crave cheese, carbs – in college I had pasta almost every day!! – but never really sweets. Sure, I rarely turned them down either, but I literally could not say no to a plate of pasta. Sweets I could have lived without. Then things changed. I could care less about cheese and pasta now – again, SURE, I miss them both from time to time but I don’t long for them. What I do long for most days is just a simple cookie or two that won’t break my AIP diet, or any baked good really! …..
First of all, sorry for the shadowy pictures – I am no photographer, that’s for sure! So, this is, like, the easiest thing ever to make – and it’s almost like its simplicity makes it that much more delicious! I walked around my house eating this creamy and cold dessert going “mmmm” after every bite. The texture is perfect and the recipe leaves room for SO many different flavor combinations, you’ll never get bored! It’s best if eaten right away but can be frozen – it will just need to thaw a bit on the counter or more quickly in the microwave to regain its creamy texture. 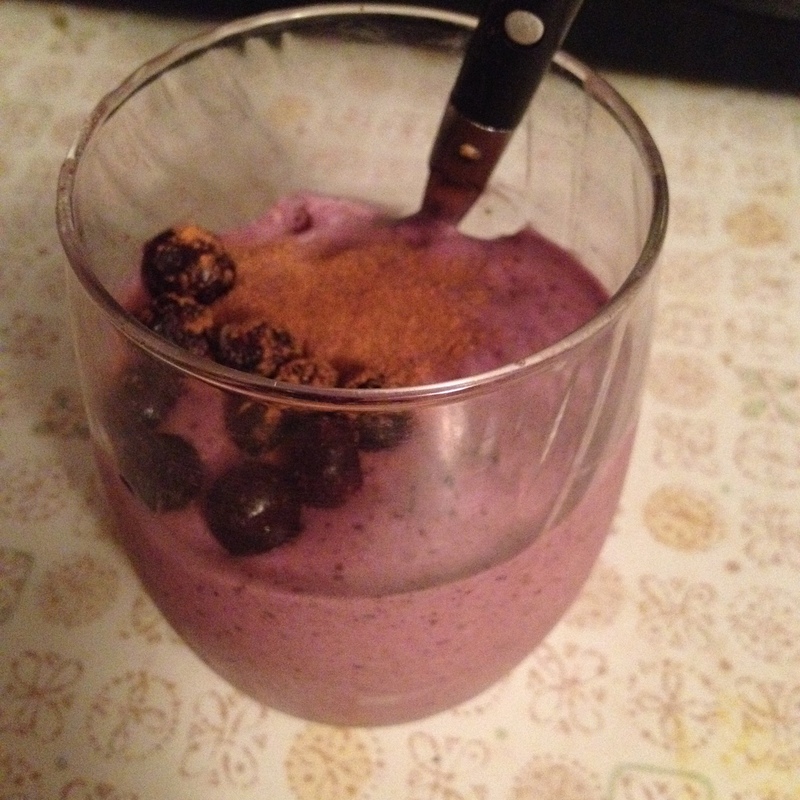 I used my Nutribullet to make this treat, but a blender or food processor would work just fine. I’m still currently saving up for a good food processor, so the “‘bullet” was a good second choice. Add all the ingredients into your Nutribullet, blender or food processor and mix/pulse until smooth. Using the bullet I had to pulse mine a couple times and shake the mixing cup once or twice since the mixture was pretty thick. If you want a thinner texture add a teaspoon or two of the coconut milk left in the can after scooping out the fat (clear or milky liquid), and if you want a thicker texture, add more banana or try a couple of ice cubes and pulse until well mixed. The mixture should have the texture of soft serve – hence it’s name! As you will notice, I didn’t add any additional sweetener, but a little honey, coconut sugar or maple syrup would be nice!! Once warmer weather is here to stay, i’ll be pouring this mixture into some popsicle molds for a quick treat! cinnamon – it’s your call on the amount – I added some into the batter and sprinkled some on top of the cookies before I put them in the over. I REALLY like cinnamon. Roll dough into balls of about 1″ in size and flatten with fingers to about 1/4″ thick. Depending on size of cookies, this recipe makes between a dozen and 16 cookies. Bake for 40 -45 minutes, checking every so often that the cookies aren’t burning. My cookies were soft on the inside and fully baked and a little chewy on the outside, and reminded me of cake! Once these cooled, I squirted a little honey on them and they were amazing! So amazing, I ate too many, kind of defeating the purpose of a sweet “treat” – it was more like a sweet meal. Still, it was better than eating too many processed cookies. Just be careful with coconut flour quantity if you have UC. BUT 2 or 3 of these puppies with a hot cup of black coffee or tea in the morning with a little fruit or (((bacon))) would be the perfect start to any day. Hope you enjoyed these recipes! Have any ideas on how to make them better – please let me know!! Flaring Up? Don’t pop more pills just yet! So I am 12 days into my Autoimmune Protocol diet to begin to heal my Ulcerative Colitis, an autoimmune digestive condition (check out “The Paleo Mom” with LOADS of AIP info, recipes, explanations and more). Two big changes I’ve noticed in my colitis symptoms in the past couple of days are: 1) I haven’t bled in the last 4-5 days and 2) the heavy, “inflammed” sensation I was experiencing at the base of my tailbone has greatly subsided. Don’t get me wrong, I’m still experiencing gas, bloating, and some urgency, etc. – but it’s a step in the right direction in my book, and my condition feels quite manageable for the time being. 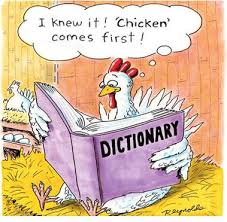 My goal is to continue with AIP for at least 2 months before I begin reintroducing foods – MAN do I miss EGGS, though! I’m thinking outloud here – the whole “Reintroduction” phase on this elimination diet scares the living hell out of me, because it seems like such a precise process where one slip throws 2 months of strict AIP down the drain! I’m a worryer, so of course, I’m already stressing about what’s to come! 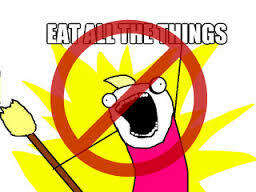 …Orrrr eat NONE of the things?? 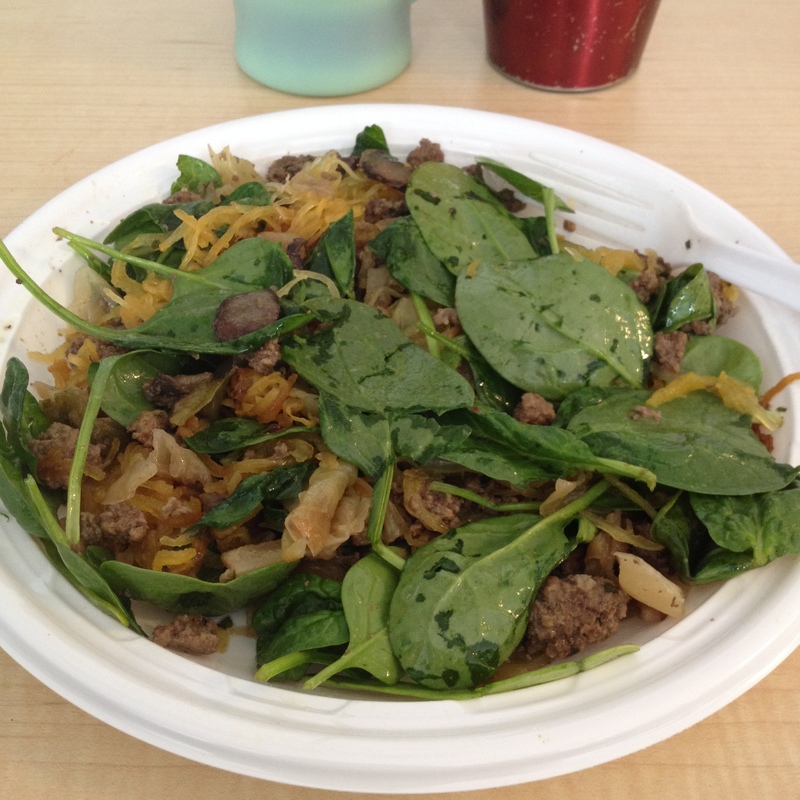 Have you had an experience with re-introducing foods on AIP/Paleo/Specific Carbohydrate Diet ??? How did you go about planinng for it realistically? Or did you just choose to avoid these foods in your diet indefinitely? 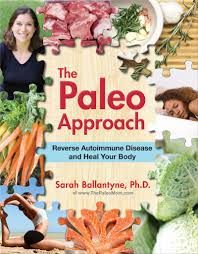 Also I’m thinking about buying “The Paleo Approach” by Sarah Ballantyne – has anyone read this book and could give me a quick review?? I suppose maybe this fear of “reintroduction” is what has kept me from truly implementing “AIP” in my life for some time now – any feedback you can offer about your own trials, errors and succsses is greatly appreciated! I’m not ready to post my next “3 Ways to Happy Post”, but I did want to share some natural ways I like to calm my flare ups and symptoms when they hit, WITHOUT having to increase my medication. I hope these tips help you, but please – I’m not a doctor. If things are serious, get the help you need! —- Try sipping some aloe every day. It soothes inflammation from the inside, just like it soothes sunburn on the outside! I buy the Lily of the Desert brand from my local natural grocer. If you don’t like the taste, add it to a smoothie and mix it into a low-sugar organic juice! 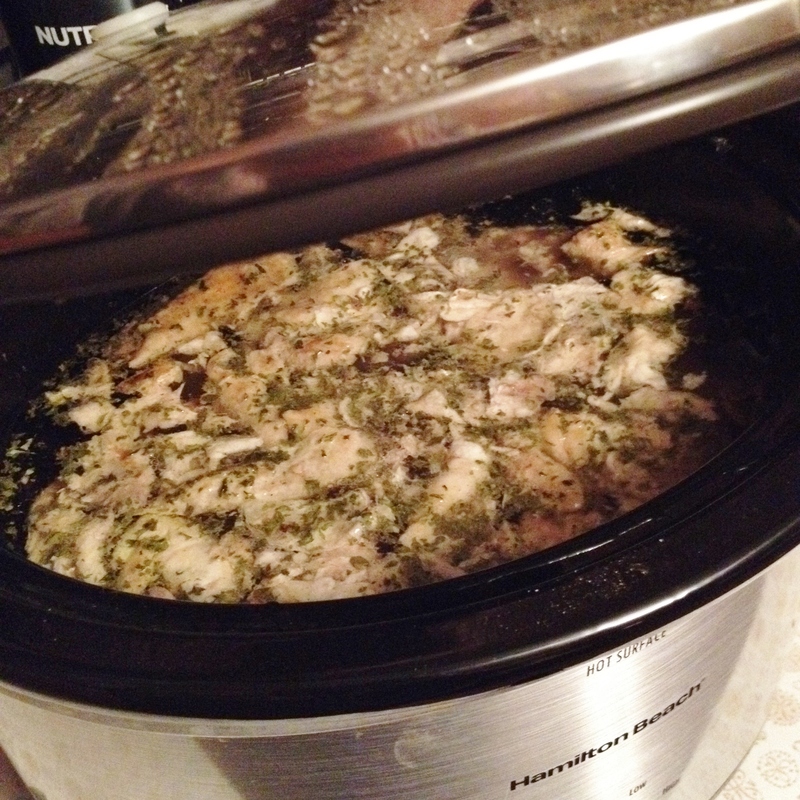 —- Drink some healing homemade bone broth, – check out my first post for a simple crockpot recipe! —- Eat soft foods, while still getting nutrients. Steam or boil all vegetables to make them easier to break down. 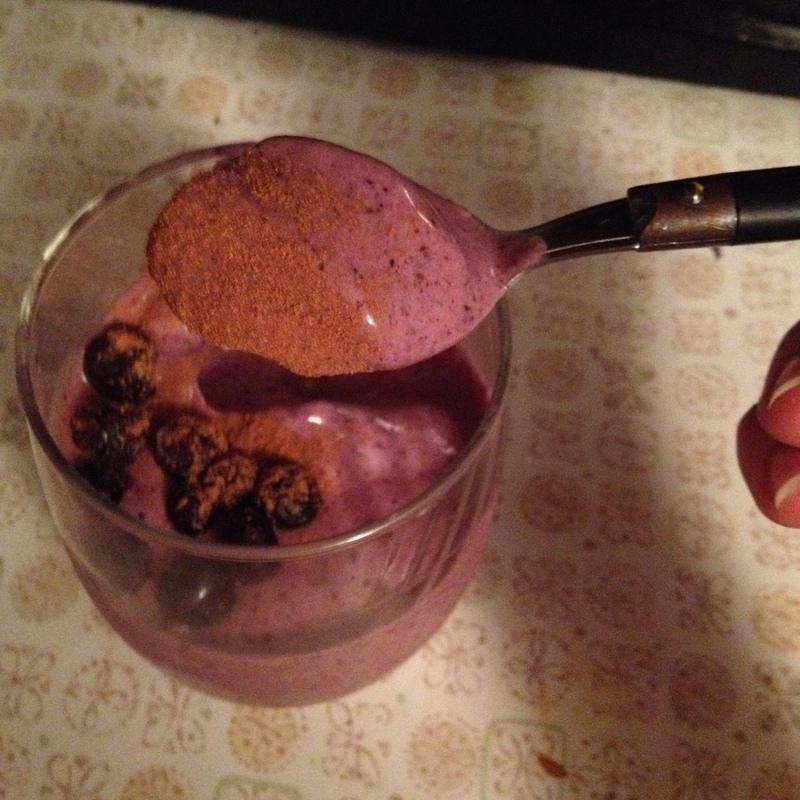 Puree fruits, drink smoothies with avocado and banana, eat less-fatty meats. I personally really enjoy certain canned veggies like green beans and carrots. Gross to some maybe, but to me they are the next best thing! —- Consider taking a daily digestive supplement like GI REVIVE – a nutritionist I saw suggested I take it, and though I am not currently taking it, I still have some in my pantry on hand in case a flare-up rears it’s ugly head. 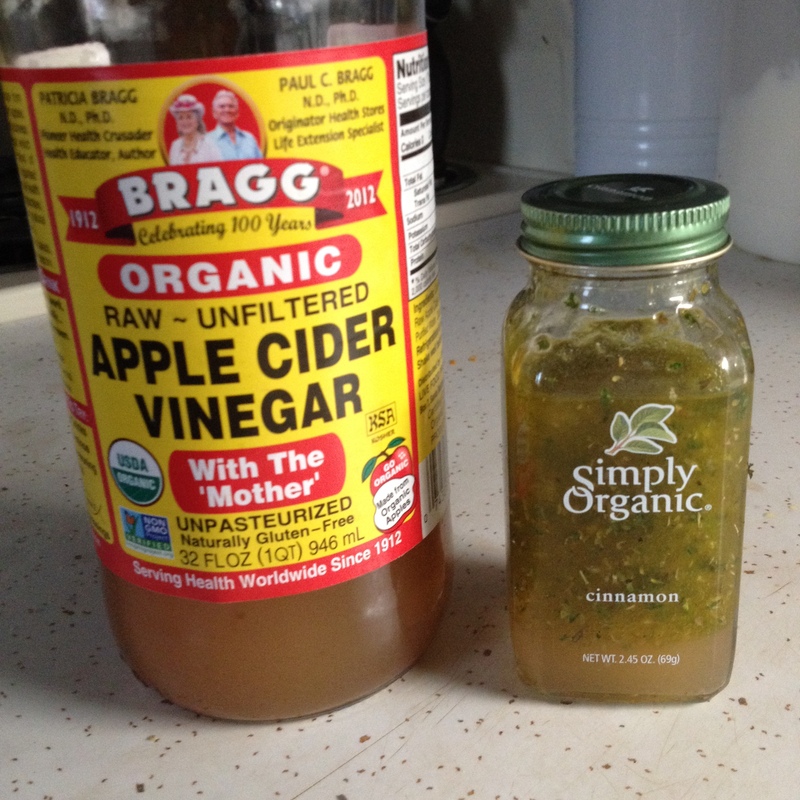 —- If I’m going to have a big meal, I sometimes take a swig of apple cider vinegar to aid in digestion and to ward off gas, bloating, etc., which worsen my flare-ups. Try getting ACV into your diet in other ways like making your own delicious and health packed salad dressing! I mixed up my own (below) in an empty glass spice bottle – 1 parts ACV to 2 parts olive oil, Himalayan salt and herbs to taste. I used oregano, parsley and onion powder. —- Cut back on dried fruit – for me, dried fruit blocks me up, for some it does the opposite. There is lots of sugar in dried fruit and cutting out that extra sugar can help regulate things. —- Take up a calming hobby like yoga, jewelry making, reading, painting, writing, walking, etc. Not only is doing something you like stress relieving, it will also get your mind off of harping on your current flare-up. —- Sleep! Sometimes a hot cup of chamomile tea and an early bed time can do wonders! Snuggle up with a good book, sip some tea, decompress and conk out! And don’t forget to breathe deep! —- Ease stress during flare-up times by being over-prepared – meal prep for a couple of days with soft, healing comfort foods so you won’t be tempted to eat any problem foods when hungry and stuck in a pinch – this one is embarrassing, but pack an extra pair of undies (maybe even some TP) in your purse, book bag, gym bag, etc. Obviously, the plan is to NOT use these items but at least you know they are there if need be! —- LAUGH! Go watch a funny movie, hang out with your funniest friend (my boyfriend in my case, yes I’m lucky). Now – I’m SO interested to know – what are your healthy flare-up management tips?? Can’t wait to hear from all of you! Stay tuned for my next “3 Ways to Happy” post in the next day or so! During my senior year of high school, I started seeing blood in the toilet when I went #2, accompanied by diarrhea, an increased urgency to use the bathroom, cramping, awful gas and bloating, severe fatigue and swollen joints. Even as an 18-year-old, I knew that seeing blood when going to the potty was never a good thing. I was a really good student, played 3 sports, and was going through my first real “break-up” – I boiled my “issues” down to stress and figured it would stop. Plus, it was an extremely embarrassing problem to have, especially as afemale teenger – I mean, I was just happy to have days now and then when they weren’t huge pimples on my face… So, I chose to play down my debilitating digestive symptoms and pushed through my senior year. That’s me in the front row with a bunch of my friends senior year right after I was diagnosed. I look happy, and I probably was, but was still working hard every day to NOT show my peers how awful I felt inside. So what DID a diagnosis of Ulcerative Colitis (UC) mean for as an 18-year-old? Well, to start, a lifetime full of a medication called “Asacol” (9 pills a day to be exact), no knowledge of ANY cure, cause or treatment for UC other than daily medication. UC, a form of “Irritable Bowel Disease” is an “incurable” Autoimmune Disorder where my body attacks my own colon as a foreign object. My doctors told me food played no role in my symptoms or the onset of my disease and that my only option was to pop lots of pills to control my “flare ups”, or periods of bleeding/inflammation/diarrhea/lots of time in the bathroom. —-> Following a couple diets called the “Autoimmune Paleo Protocol”, and the general “Paleo” or “Caveman” diet – I’ll get into specifics later, but you can learn more about AIP here at one of my favorite blogs. While following AIP, I do my absolute best to eat no gluten, grains (including corn), dairy, refined sugar, eggs, nuts, seeds and nightshades, and try to keep my natural sugar intake as low as possible. Many of my posts will pertain to this subject, as every day is a new adventure and/or struggle with keeping this restrictive diet in check. In fact, my hope is that this blog (and hopefully a handful of followers in the future) will force me to take even more accountability and responsibility for my health when it comes to my diet. I’ve definitely been loosely follwoing AIP for the past coupls of month, and I’m ready to get more serious about ultimately healing my UC through this seemingly promising regimen. —-> Practicing Yoga when I can (I should do it daily). The wonderful, deep breathing I’ve discovered through Yoga is the only thing I’ve found that truly calms me down and clears my head. I love following free videos on YouTube or http://www.doyogawithme.com/. Stress very negatively affects my UC symptoms and flare-ups, so keeping my stress levels as low as possible will continue to be an important part of my healing. —–> Visiting a couple Holistic Health Practitioners who introduced me to various digestive and hormonal support supplements that I have used to literally “supplement” my AIP diet. My learning curve with supplements has made it even clearer to me that the secrets to my healing success lie somewhere within Mother Nature’s caring embrace. I’ve tried a handful of different supplements and will comment on their effectiveness, price, etc. throughout my posts. —-> Experimenting with DIY personal hygiene and home care products like toothpaste, makeup, remover and all-purpose cleaning spray, to eliminate as many toxins from my daily routine as possible (and to save a little money!) to protect my already compromised immune system. This is time consuming, but so worth it for the peace of mind and money saving – and it’s kinda fun! 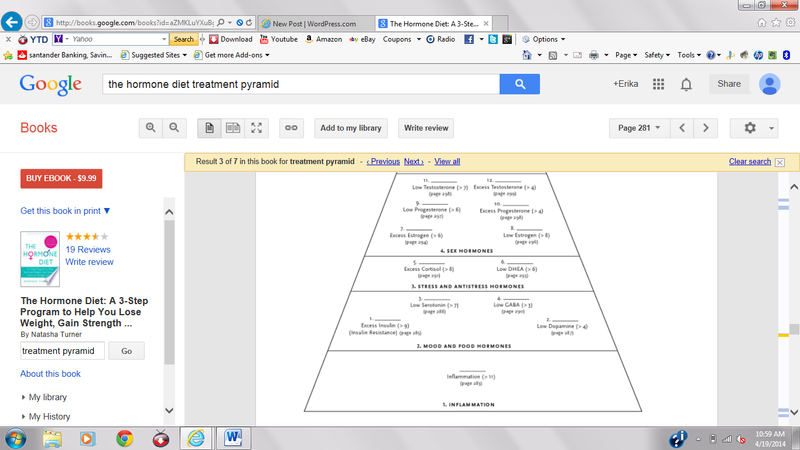 But, seriously – WOW do I feel better! I’ve lost weight (about 20 pounds in the last year, without really trying), I have more energy and more mental clarity, reduced bleeding and “flare-up” severity, less bloating, less acid reflux, reduced joint swelling, clearer skin. This is all great, and call me crazy for wanting my UC to be GONE – but I believe that with time, effort and perseverance I can ultimately reverse my condition, too. I’d love to hear about your journey – email me at ezaborny@gmail.com so we can connect! At this point, I want to introduce my 1st “3 Ways to Happy” post, a weekly (hopefully daily in the future) feature where I will include 3 “projects” I’m currently working on to improve my health and happiness holistically. A lot of my inspiration comes from Pinterest – people, if you aren’t “pinning” already, what have you been doing with your lives???? Please follow me on Pinterest HERE! 1) Our garden plans are in the works! My boyfriend, Seth, and I moved in together about 6 months ago and we are so excited about starting our first garden! 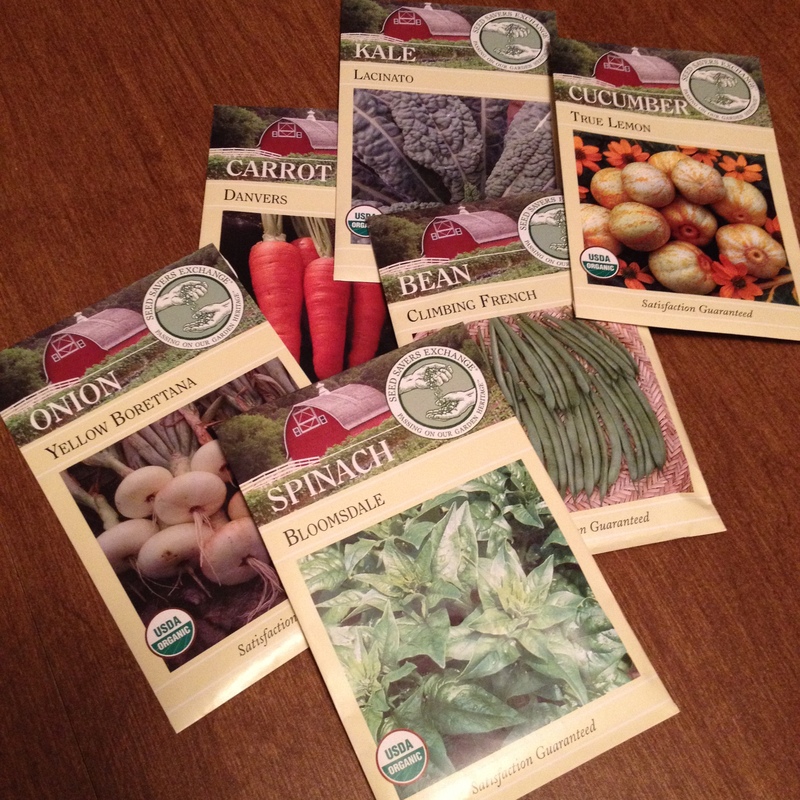 We picked out a handful of organic seeds from Seed Savers Exchange, a non-profit company with a GREAT selection of hundreds of seeds. I’ll definitely be keeping track of our garden’s progress on “Holistically Happy”! 2) My first experience with gut-healing chicken bone broth – this recipe could not have been simpler. I simply put chicken bones, skin and cartillage left over from a whole organic chicken we used for soup in our crock pot with a couple cups of water (less if you want a stronger broth), a couple glugs from my Apple Cider Vinegar bottle and some himalayan salt, garlic powder and parsley. Man, is a warm mug of this stuff comforting! My goal for right now is to try to have one cup a day, and eventually increase to 2-3 cups daily. 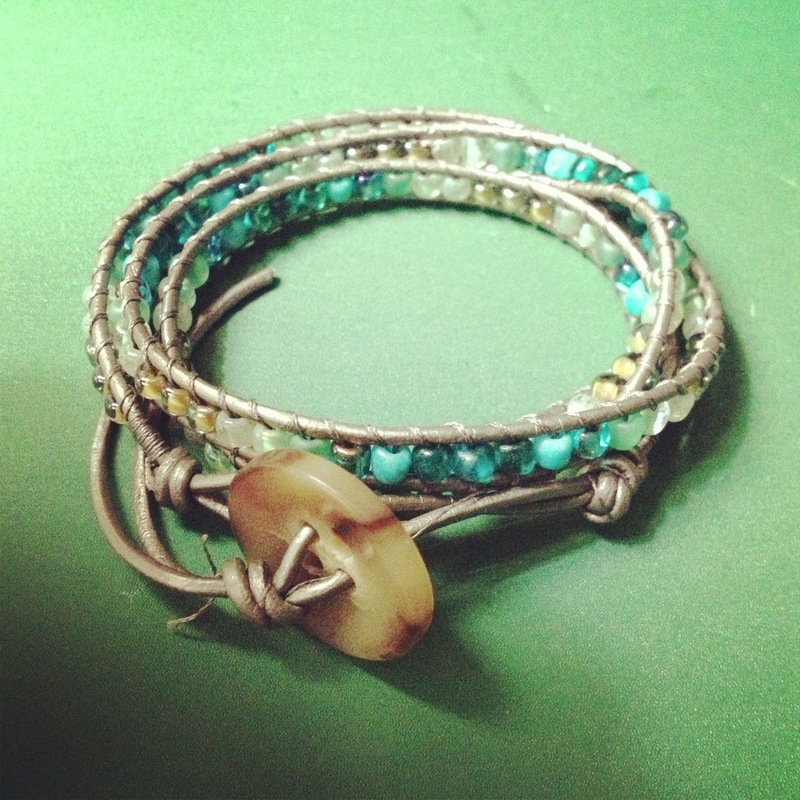 3) Bracelet Making – for a little extra income and as a hobby! I’ve been making leather beaded wrap bracelets for the past 2 years that I sell at the Pennsylvania Renaissance Faire, which is about 20 minutes from my house. Not only do I make a little extra money from selling these bracelets, it’s also a great stress reliever for me – most days! I create custom size/color/length/design bracelets, so if you’re ever interested in purchasing one of my handmade creations, email me at ezaborny@gmail.com! Whew – that was a novel of a first blog post – but, boy, that felt GOOD to just get it out. What are 3 things you’ve done lately to take care of yourself in the name of being holistically happy and healthy?